Susan comes to stained glass from a background in painting. 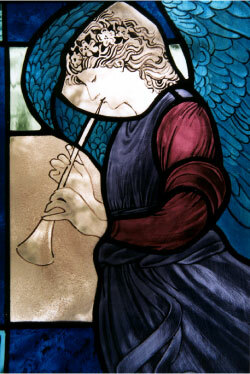 This gives her an added understanding of the nuances of colour which the stained glass medium affords. She is influenced by the traditions of the medieval and Art Nouveau periods and by the Charles Rennie Mackintosh Glasgow School. Susan produces small decorative articles, such as boxes, mirrors and jewelry, using the copper foil technique invented by Tiffany. 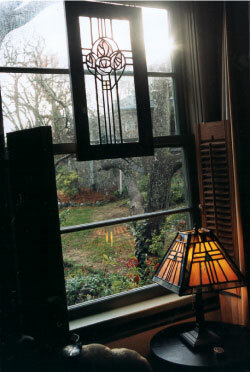 She also creates lamps, panels and windows using traditionalleaded glass methods. She has also explored the age-old process of painting and firing glass which date back to medieval times. Commissions are welcome. She also paints heraldic themes on glass and accepts commissions to depict individual coats of arms or crests in panel form. 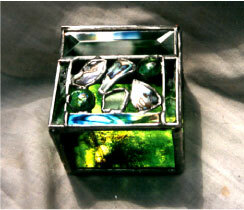 It has a mirror bottom and is decorated with beach glass from the seashore, abalone shell and glass jewels. 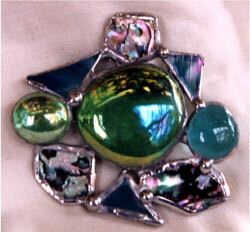 Brooch with abalone shell, irridescent glass and glass jewels. 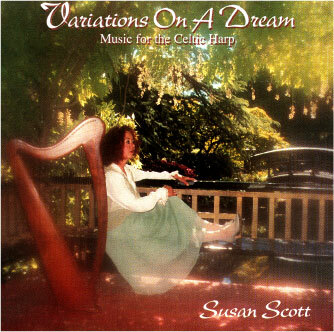 Susan plays the Celtic harp and has 20 years of experience playing professionally for weddings and special occasions. She has also released three CDs of solo harp music and will, in the summer of 2002, have a book of her arrangements published by Lyon and Healy Harps of Chicago. Check her website at www.klatu.com/dreamsounds. "Her interpretations are inspired and inspiring. Recommended."